The second section of the 10th Special USNCB arrived in the UK during September 1943 at Countess Wear, construction starting on 12th October by the Seabee units, the 10th and 25th Naval Construction Battalions. According to documenst they were required to provide storage buildings, offices shops, open storage area, hut camp, mess hall and galley, recreation buildings, Red Cross building, chapel, utilities, roads, walks and fencing. The original plans called for 79 warehouses of 400,000 sq feet, but by December this was increased to 578,000 sq feet with 1,000 personnel. October through the winter of 1943/4 proved to be an especially wet time in Exeter. Within a very short time of the start of construction the "beautiful golf course.... turned into the epitome of a mud hole". The men working on site were effected with 'mudphobia' - after a day at work clothes were caked in mud, giving off an unpleasant odour. A total of 100,000 loads of rock and sand was dumped onto the site to create 7 miles of roads that would support the largest trucks without them disappearing into a quagmire of oozing, sticky mud. The mud lingered and hindered through the end of 1943 and into 1944 - the site would not eventually be free of mud until the spring. On the 3rd February 1944 the depot was commissioned and the supplies needed for the largest amphibious landing in history could be stockpiled and then distributed to the waiting merchant ships and amphibious landing craft. 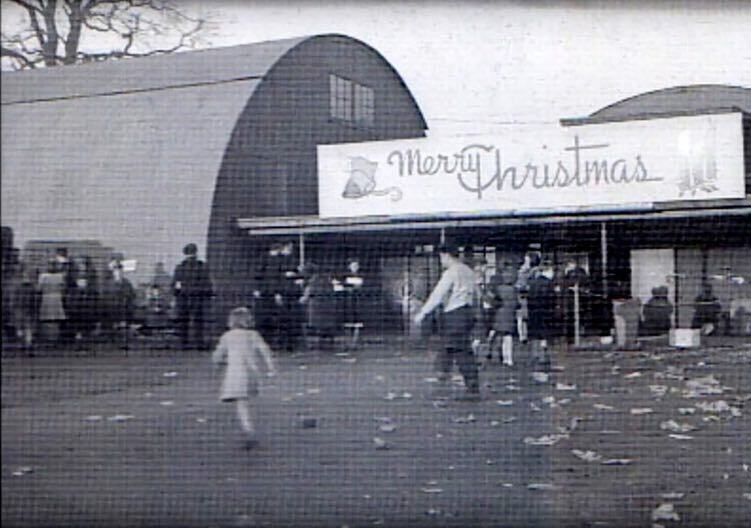 Most of the warehouses were US designed Quonset huts, measuring 40 feet by 100 feet; they also served as the housing for the personnel. In total 85 warehouses and 198 huts for housing and administering the personnel were constructed. Bill Witt remembered his arrival at the camp. We were told that they were going to Exeter to a new camp specially built for us, but on our arrival we found a muddy site with tents, our officers told us we could have huts to live in, when we built them!!. 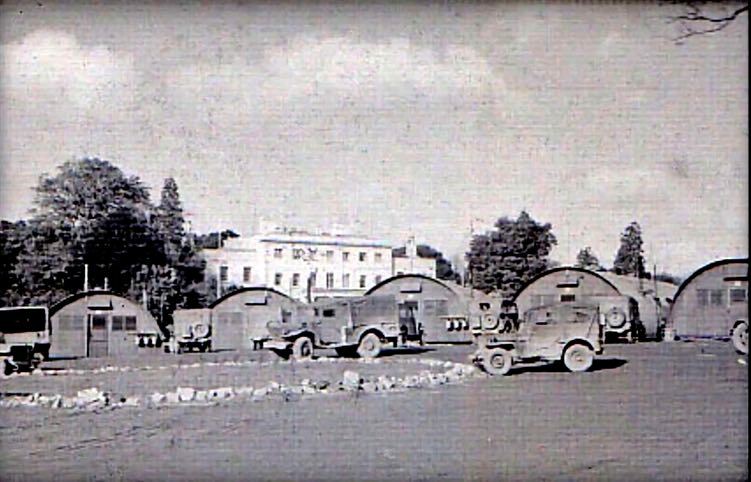 The camp was beside the Golf Club at Countess Wear. We worked hard building the base and were allowed time off in the evening, we went into the town and saw where all the bombing had happened. I suppose that I realised for the first time, how you had suffered in the war, until then the war was distant to us in America. The black out was something new to us all, we had been used to seeing where we were going! Above all, the task of receiving, storing and despatching the vital war material could commence. At first up to 200 railway wagons would come into Exeter for unloading each day – much of the stores were placed in the open or in hastily erected tents. In total 19,600 railway wagons arrived and were unloaded at the railway sidings, loaded onto road transport and driven to the 95 acre Golf Course, and the 75 acres of the Hawkerland Valley and Winslade Park. The ancient, narrow lanes of Devon were shaken and stirred by such an army of trucks. By late February 300 trucks per day would be loaded at the stores and despatched to the embarkation ports, trundling down the spine of South West England, day and night, day after day, week after week. The United States Navy provided sleeping accommodation, barbering, galleys, a pay unit, an inventory unit, truck repair facilities and even a section devoted to repairing typewriters, that was housed on the site of the 1st tee. 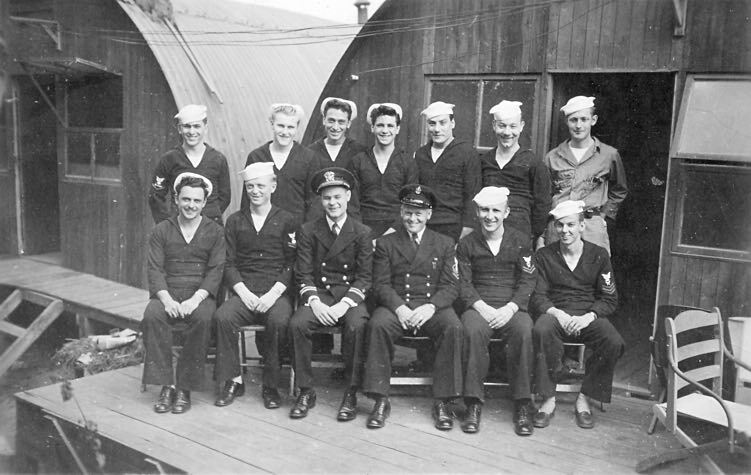 The men of the US Naval Construction Battalion were also employed at Plymouth, unloading a ship every 3 days using lighters from mid-stream. It took 200 officers and 2,600 men to run the main camp along with another 17 officers and 527 men at Plymouth. Eventually, D-Day arrived and the stores and equipment that had been unloaded and processed over so many months were being unloaded onto the beaches of Normandy. Much of it went ashore across the Mulberry Harbour, part of which was constructed by Willeys at Water Lane. As the Allied Forces gained a foothold in France and advanced towards Germany, the vital equipment for the war effort would be shipped directly to French ports. The Exeter base was closed and returned to the British authorities by 31st July 1944. Wear House was the club house for the golf course. 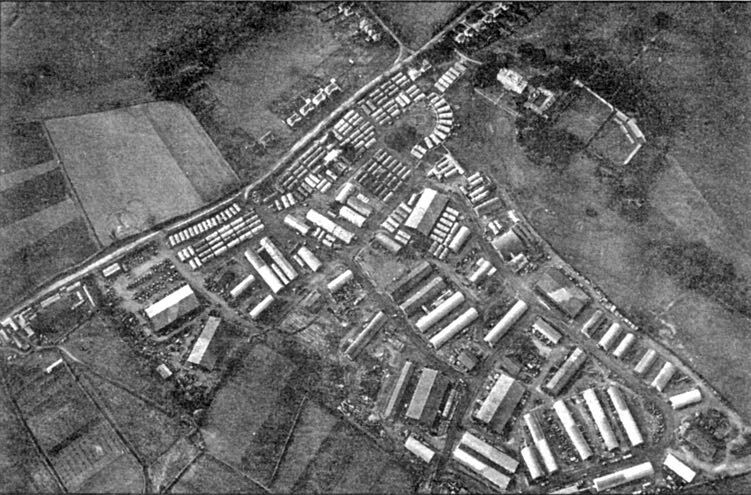 The camp from the air. Topsham Road runs diagonally left to right. 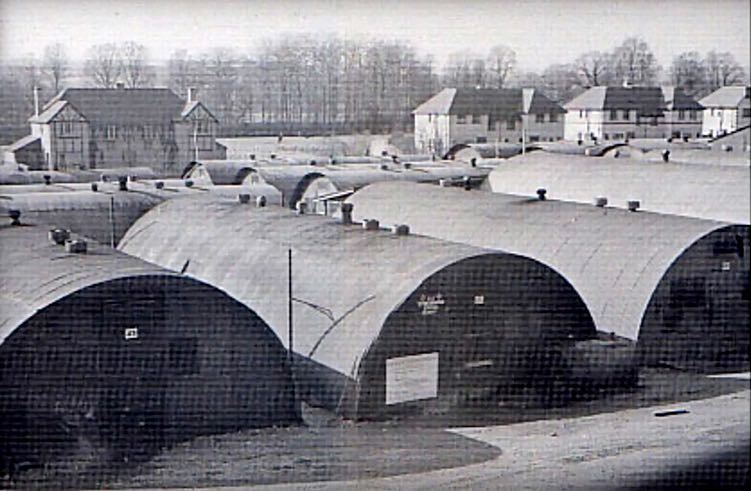 Quonset huts, with houses on Topsham Road behind. Christmas entertainment for the men and their girlfriends. 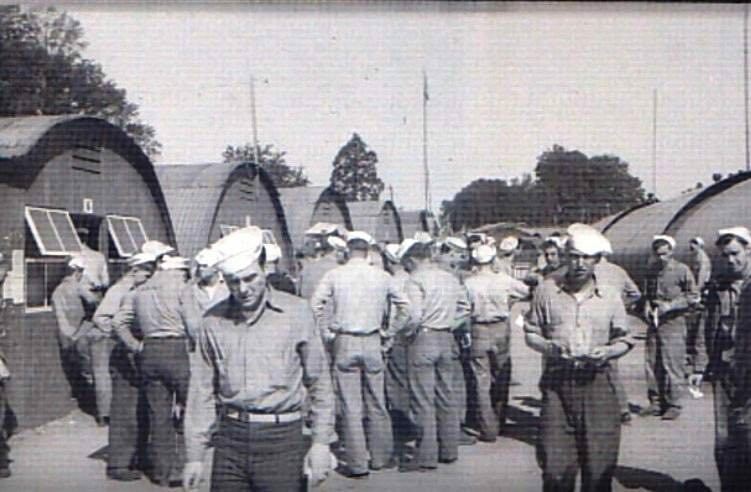 Navy men mustering outside the huts. A group of men and their officers.